On December 21, 2018, Detectives from the Ventura County Sheriff’s Office East County Street Narcotics Team concluded a narcotics sales investigation into Nicholas Young of Woodland Hills, who was involved in the sales of narcotics to residents of Ventura County. On December 21, 2018, Narcotics Detectives contacted Young at a shopping center in Los Angeles a short distance from his residence. Detectives detained Young and searched his person pursuant to a signed search warrant issued in Ventura County. Detectives found Young in possession of over two ounces of “Molly” or MDMA, which is also commonly referred to as ecstasy. Young was also in possession of a significant quantity of Lysergic acid diethylamide (LSD), which is an illegally obtained synthetic hallucinogenic drug. Young was arrested and transported to Ventura County. Following Young’s arrest, Narcotics Detectives executed a search warrant at Young’s residence located in the 24000 block of Philiprimm Avenue in Woodland Hills. 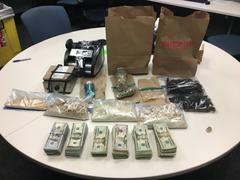 Detectives located a significant amount MDMA, LSD, Ketamine, psilocybin, paraphernalia indicative of narcotics sales and money believed to be proceeds from narcotic sales. In all, detectives seized 7.6 pounds of MDMA or approximately 3447 grams and well over 100 doses of LSD. The MDMA seized has an estimated street value of $275,760.00 to 344,700.00. The LSD street value ranges from $1000.00 to $2000.00. MDMA (Molly) is an illegal and dangerous “club drug” that is abused for its stimulant and hallucinogenic properties. LSD is also illegal and abused for its hallucinogenic properties. MDMA and LSD are extremely dangerous and their use can lead to severe medical complications and even death. Young was subsequently arrested and booked at the East Valley Jail for narcotics related offenses and his bail was set at $250,000.00.